THE BACKSTORY: Long before the term "eco-resort" was co-opted by any hotel with recycled note pads and a few compact fluorescent light bulbs, there was Sea Ranch. Back in 1963, a development group from Hawaii purchased nearly ten miles of Pacific Ocean coastline 105 miles north of San Francisco. They were determined to restore the barren rangeland of this former cattle ranch to its natural state, and in addition to planting trees and re-seeding native grasses, they designed enclaves of small, weathered-wood homes for people who shared their environmental ethic, which adapted the old local Pomo Indian principle of living lightly on the land. 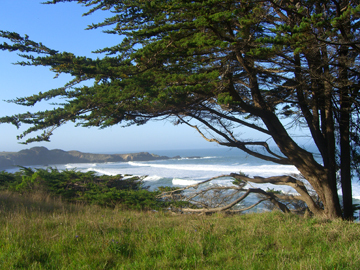 Forty-four years later, Sea Ranch is still a landmark in environmentally-sensitive development. 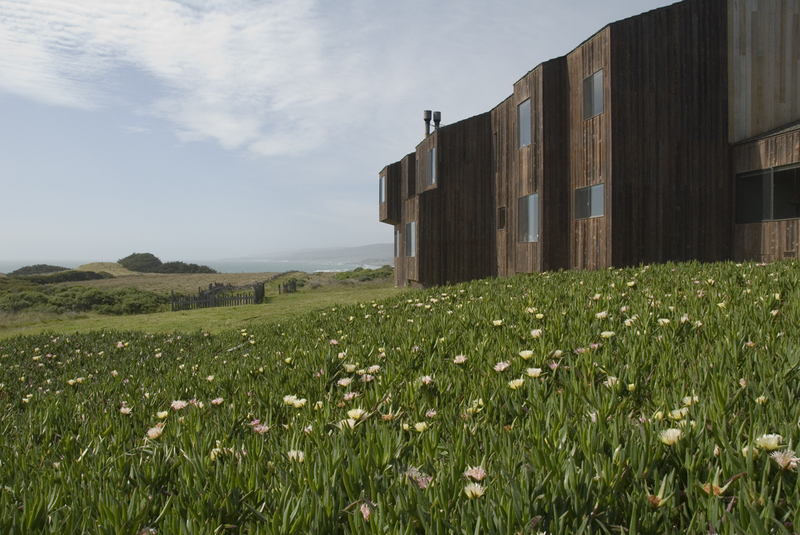 Although there are over 1,400 homes now (including a few newer houses that are both out of scale and out of tune with the Sea Ranch aesthetic), the design paradigm of simple forms that fit into their individual landscapes from hedgerows to forest glades to grassy uplands is largely intact. 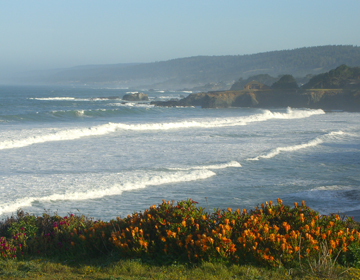 Many of the homes at Sea Ranch are available for rent, some for a little as two nights. In addition, there’s the Sea Ranch Lodge, at the southern end of the property, with 20 guestrooms and a fine restaurant, not to mention one of the world’s most inspiring settings. WHY IT’S A CONTENDER: Sea Ranch Lodge seems to exist on the principle that the best statement is understatement. And given a setting this beautiful with the chilly, foggy Pacific pounding the bluffs just beyond the meadows of white calla lilies a few yards from your window, not fixing what isn’t broken is certainly a good idea. So if you need granite countertops, flat-screen tv’s, and a staff that sprays Evian mist on your brow while you lounge by the pool (oops, no pool), I’d suggest you look elsewhere. (Though I’m not exactly sure where you’ll find that "anywhere" on the northern California coast.) If a window seat, leather club chair, comfy platform bed, and simple but elegant wood furnishings (that actually manage to give the 60’s a good name) are all you require to commune with nature, this is the place. THE DEAL: Rates range from $230 to $395 per night, although midweek and off-season specials often push prices down into the $170 range. All rates include a very appealing multi-course breakfast. Nineteen of the 20 rooms have ocean views, the other has a private outdoor hot tub in a garden. Our room, number 10, was an upstairs corner unit with a sensational view both out to sea and up the coast. Note that only two rooms have televisions. Dogs (up to 2 per room) are very welcome here. 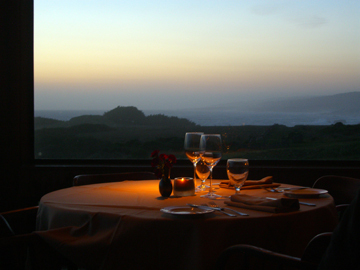 DINING: It should not come as a surprise that the dining room at Sea Ranch features a) awesome views, b) local ingredients from the ocean and nearby Sonoma County farms, and c) a Wine Spectator award-wining list of mainly California wines. Grilled veal medallions with a chorizo-piquillo pepper risotto hit the spot on a recent late-April evening. Chef Robert Schneider also offers a very enticing small plates menu every day in the bar and lounge, from grilled asparagus to chicken satay. MORE REASONS TO STAY: Did someone say romance? Dark and stormy nights, fog-bound mornings accompanied by barking sea lions, and sunny afternoons with humpback whales spouting offshore are not exactly unknown in these parts. If all those don’t do the trick, then the ten-mile long walking path atop the bluffs surely will. 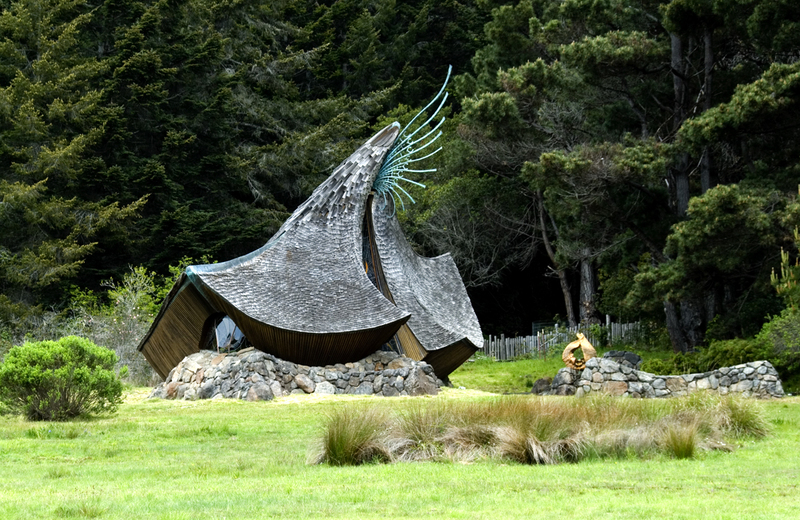 INSIDER TIP: The Sea Ranch Chapel, just beyond the north fire station on Route 1, is not to be missed. This building, which vaguely evokes a cresting wave or perhaps a very bad hair day, is meant to be a "nondenominational sanctuary for prayer, mediation, and spiritual renewal." It’s also a small-scale masterpiece in wood, glass, stone, and ceramics. If you don’t feel moved and humbled in here, something’s come unplugged inside you.